Now this is going to be tricky. First of all, I am not a costume historian, I just like clothes and fashion history. And secondly, I’m going to try not to gush over Alfred Hitchcock, let me just say this now: I ADORE his movies. So, not surprisingly, I’ve watched Vertigo (my favorite movie of all time) and The Man Who Knew Too Much (the newer version, and by that I mean the 1956 version with James Stewart) multiple times. 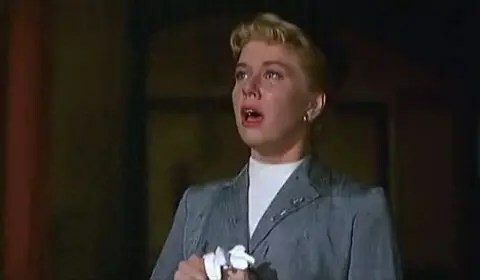 It occurred to me during my latest viewing of The Man Who Knew Too Much, that Doris Day’s suit was awfully similar to Kim Novak’s in Vertigo. I’m going to assume that this coincidence is no coincidence at all, and rather has everything to do with the fact that Alfred Hitchcock used the same costume designer in most of his movies: Edith Head. The Man Who Knew Too Much came first in 1956 and Vertigo soon followed in 1958, and both were costumed by Ms. Head …and starred James Stewart. I found some references to these costumes on IMDB (Internet Movie Data Base). According to IMDB, “Edith Head and Alfred Hitchcock worked together to give Madeleine’s clothing an eerie appearance. Her trademark grey suit was chosen for its colour because they thought it seemed odd for a blonde woman to be wearing all grey.” But, they had already given this look to Doris Day, a blonde, two years earlier. The one difference I notice straight away is the use of a hat. Doris Day’s character wears a black pill box hat with her gray suit and white mock turtleneck. Kim Novak’s character’s hairstyle actually plays an important role in the movie – as she is copying the style of a woman’s hair in a portrait. Kim Novak’s Madeline is also much more sensual and less proper than Doris Day’s Jo. So, the common denominator isn’t really Jimmy Stewart at all, but more likely, Edith Head. She was quoted as saying, “I don’t usually get into battles, but dressing Kim Novak for her role in Alfred Hitchcock’s “Vertigo” put to the test all my training in psychology.” I’m not sure if she’s talking about Kim Novak here or about how important the costumes were to the psychology of the movie and of the characters in the movie, I’d like to think the later. Let’s begin at the very beginning …a very good place to start. Of course they grew up singing ...they had a stage built into their house. 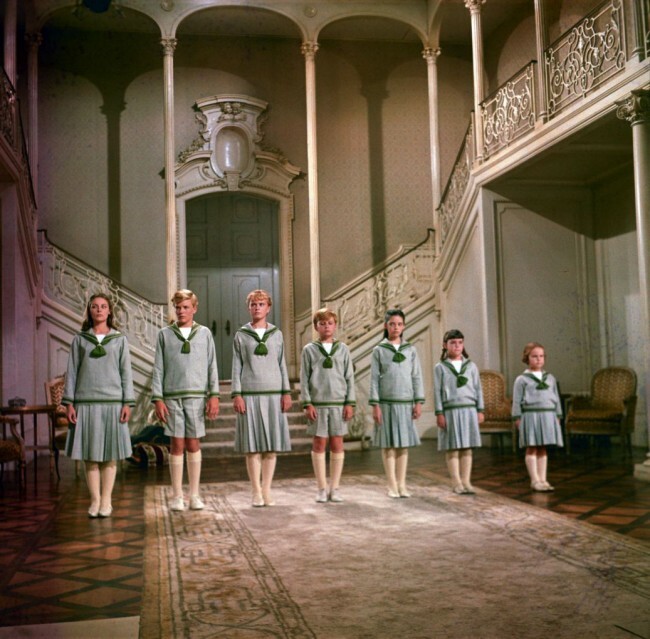 When you think back to the first time you watched The Sound of Music – I’m assuming you’ve seen it more than once – what is it you remember about it? The music? The love story? The dancing? I remember the von Trapps’ house and how I wished I could make a dramatic exit each night as a child ascending the grand staircase as I bid my parents good night. I remember that Maria goes to an armoire to get Liesl a clean and dry night gown after she has gotten caught in the rain – and I had never had an armoire. Maria and the children ...but check out that armoire! I was looking around the dining room while the children were playing tricks on Maria and trying to absorb every detail of it. And, I remember wishing I could somehow fit a marionette stage in my house. The dark wood, crystal and smooth wallpaper drew me in. 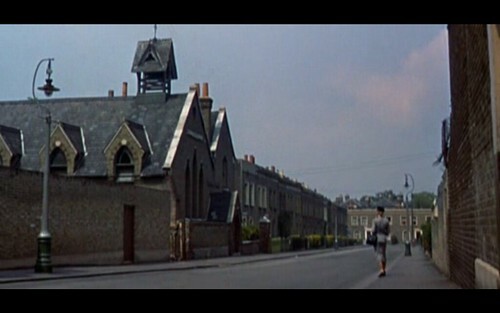 All my life I’ve been watching the backgrounds in movies. OK, I’ve been watching the stories too, but maybe my brain was doing double time or something because I would always look over at my mom after a movie and ask something along the lines of, “Did you see the dress that girl was wearing?” or, “I would love to have a room like those girls, with an en suite bathroom!” (I didn’t actually know words like ‘en suite’ when I was 8), but I knew what I liked in movies and it was the interior decoration, the furniture, the clothes and the design. So, I’ve since gotten two degrees in historical architecture and design and thought I’d share what I noticed in movies with others.